John Forbes Nash, Jr. was one of the most brilliant minds of his generation. As a graduate student in Princeton during the late 1940s, despite his charming good looks and chiseled features, Nash was found by his peers to be a socially-inept, awkward, and arrogant individual who would rather spend his days wandering the campus lost in thought than attend classes. However, by the early 1950s, Nash would make his mark with his pioneering work in game theory, becoming a star in the pantheon of the 'new math' in the process. Unfortunately, such early success would be short-lived as over the following decade, Nash gradually succumbed to schizophrenia, a mental disorder characterized by uncontrolled hallucinations and delusions, as well as disorganized thought and behavior. But as Nash spent the next few decades in and out of various institutions, his work on game theory had become a cornerstone in modern business and economic thought, with numerous real-world applications to international trade, the dynamics of auctions, and labor negotiations. Finally, in 1994, after a long struggle to regain control of his life and restore his status as a scholar, Nash was recognized for his achievements by being awarded the Nobel Prize in Economic Science for 'pioneering analysis of equilibria in the theory of non-cooperative games'. "A Beautiful Mind", based in part on the book by Sylvia Nasar, chronicles the rise, fall, and reawakening of the brilliant mathematician. 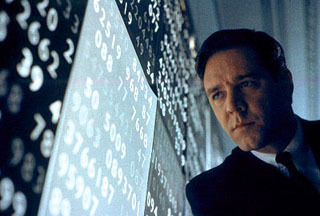 Though Nash's genius and battle with schizophrenia (played by Oscar-winning Russell Crowe of "Gladiator") remains front-and-center, the Akiva Goldsman-penned ("Practical Magic") script also focuses on wife Alicia (Jennifer Connelly of "Requiem for a Dream") and her uneasy support of Nash through decades of illness. Director Ron Howard ("How the Grinch Stole Christmas") also does a remarkable job of allowing the audience to fully experience the heightened delusional and paranoid state that Nash finds himself helplessly trapped in. As usual, Crowe brings his chameleon-like acting to bear on portraying Nash, capturing every movement, verbal tic, and gesture of the man-- my fiancée recently had an opportunity to discuss game theory with the real John Nash, and she found Crowe's verbal mannerism to be uncannily similar to the real thing. Connelly also delivers an Oscar-worthy turn as Alicia, first as the radiant graduate student who catches Nash's eye, and then as a woman who must overcome her own disappointment and fears to support the man she loves. Supporting Crowe and Connelly are Ed Harris ("Enemy at the Gates") as a shadowy Department of Defense agent who 'recruits' Nash to become a codebreaker, Paul Bettany ("A Knight's Tale") as Nash's off-the-wall 'roommate' at Princeton, and Christopher Plummer ("The Insider") as Dr. Rosen, a psychiatrist who treats Nash's schizophrenia. 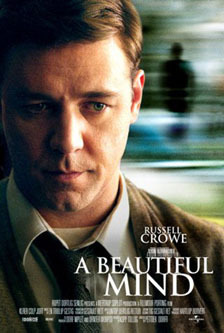 Well-written, exquisitely-directed, and superbly-acted, "A Beautiful Mind" is simply a beautiful film that will easily find a place among the year's ten best. While the dissection of Nash's intellect and illness are undoubtedly fascinating, it is the love between Nash and Alicia that serves as the film's emotional core, illustrating how pure genius and conviction are not enough to overcome adversity. Indeed, it also takes the love and support of one's family and friends to truly achieve greatness, as demonstrated by the life and times of John Forbes Nash, Jr.
Want a second opinion? Click here.